Questions are one of the building blocks of your courses. Use them to ask the learner a single question. Depending on whether a learner answers correctly or not, he or she can be taken to different course elements. Because of that, you can only add questions in the extended mode. This one is simple. You type in your question (which a learner must be able to answer with either a "yes" or "no") and mark one of the answers as the correct one. The learner has to pick the answer marked as correct to succeed. You can also add an optional description (the description is displayed beneath the question itself and is visible to the learner), or illustrate your question with an image, or do both - who are we to stop you? Add a description. The description is displayed beneath the question itself and is visible to the learner. Enable the learner to select more than a single answer. This replaces radiobuttons with checkboxes and gives you the ability to mark more than a single answer as correct. To answer the question correctly, the learner has to select all correct answers to the question without selecting any incorrect ones (this makes it significantly harder for the learner to guess the correct answer if he or she do not know it). Supplement answers to the question with pictures. This way you can create questions with answers in the form of images rather than text. Create additional answers. The minimum number of answers to a multiple choice question is two, but it is recommended to have no less than four. Illustrate your question with an image. Have the order in which answers to the question are presented to learners shuffled every time a learner attempts to answer the question. It is recommended to enable this option unless you have a reason not to. This type of question presents the learner with a number of answers and asks them to arrange those according to the specified criterion. For example, you can use sorting questions to have learners arrange historical events in the order in which they occurred, or specify the correct sequence of steps within a procedure. The learner answers a sorting question correctly if he or she put all answers in the order specified during the creation of the question. 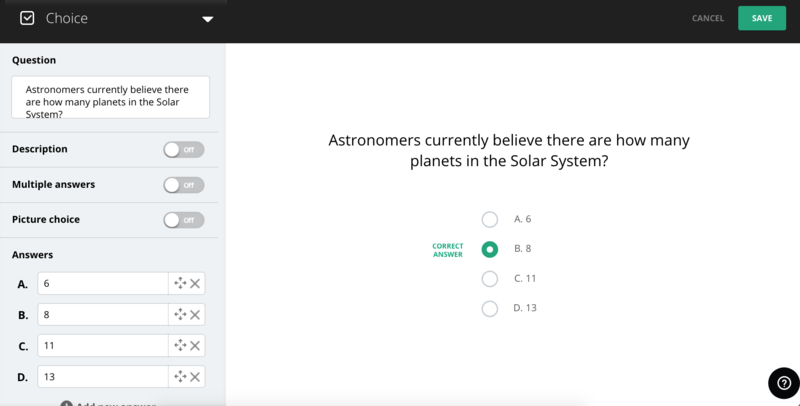 To customize a sorting question, you can add an optional description (the description is displayed beneath the question itself and is visible to the learner), or illustrate your question with an image. You can also add more answers (by default there are two). Finally, there are two text fields - one at the top of the list, and one at the bottom - that serve to help learners understand how they must arrange the answers (top to bottom or vice versa). Matching questions have learners match items from two lists ('locks' and 'keys'). For example, you can have a list of terms as 'locks' and a list of definitions as 'keys'. To answer a matching question correctly, the learner has to match every lock to the appropriate key. As with all other question types, you can add an optional description (the description is displayed beneath the question itself and is visible to the learner), and you also can illustrate your question with an image. What's more important, however, is that you can add both additional locks and keys. Note that the number of locks does not have to correspond to the number of keys. Every lock has to have at least one key matched to it, but you can match more than one key to a lock if you wish. You can even have keys that are not matched to any of the locks as red herrings. And if that is not devious enough for you, you can have the order in which locks and keys are presented shuffled for good measure (it is a good idea to enable this option unless you have a good reason not to). This question type is easy to explain. You type in the question and the answer in the corresponding fields. The learner has to type in exactly the word or words you designate as the answer to succeed. You can add an optional description (the description is displayed beneath the question itself and is visible to the learner), and you also can illustrate your question with an image. A gap question is more or less a text reply question on steroids. In short, you type in a declarative sentence, and then mark any of the constituent words. Choose the word or words that you want to become "gaps" - that is, blank spaces the learner needs to fill in. The learner's input has to match the marked word or words exactly for him or her to succeed. Note that this demands care on your part - make sure that there is no room for interpretation (like there is in this example) when constructing text gap questions. To make it a bit easier on your learners, the Select answers from the list option allows you to give learners options to choose from. For every marked word, you can type in a number of alternatives, so that the learners will be able to choose their answer from the list.